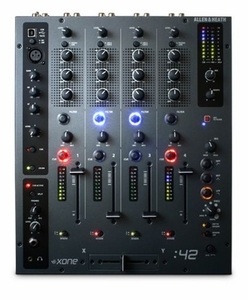 The Xone:42 is a new compact 4 -channel DJ mixer with USB audio interface, designed for DJ’s of all abilities and experience from top pro DJ’s to bedroom enthusiasts who want a compact quality mixer with pro features. Integral to the mixer’s design is a new feature – the ‘X-FX‘ control - allowing signal to be sent to external FX, and returned to be combined with the now legendary Xone VCF filter system. There’s even a USB port which allows easy connection to a computer and integration of digital media, which can be used to play back music files from a laptop and to record mixes, or used with software as a digital DJ effects unit.